The smartphones have become smart but I ask you again, have they reached a point of complete freedom to you? I would say no, they are just smart enough to handle email, take photos and few editing. But these phones are not smart enough to automatically turn off your GPS or Wi-Fi signal when you are not using them or doesn’t have a proper settings to make your task automated. 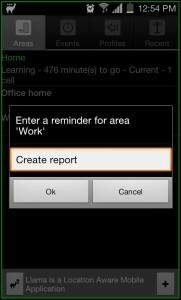 The Tasker is the Android application which does the most of the things on your phone total automatic but the only problem is that it’s the paid application costing your $ 3. Here comes the free solution in the form of the Llama application which has got easier along. 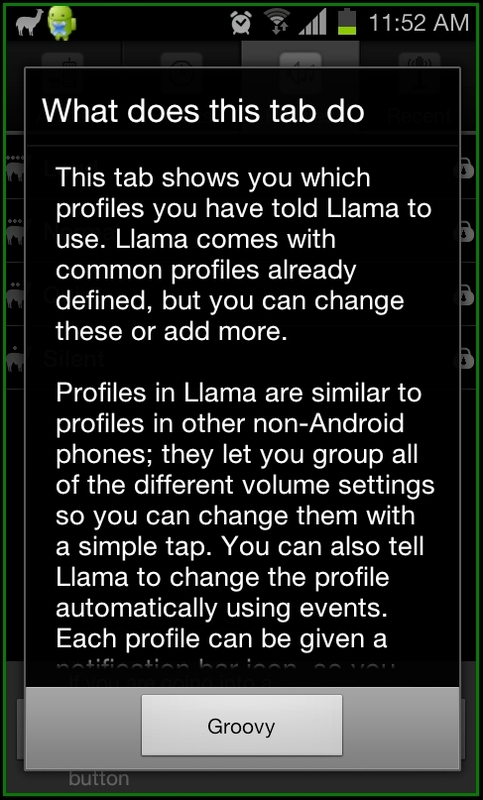 So whether you want to switch off your phone at night or keep in silent mode or at college then Llama is for you. Llama is the dedicated application for all the smartphones which are powered with Android operating system works for Android version greater than 2.1 till the latest Android OS version. This is a location based application which can change your ringer, vibration, ringtones depending on where you are on a particular time of the day. 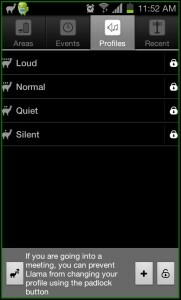 This application interface is provided with the sound profiles settings by which you can quickly switch between various options of loud, silent, normal and other settings. Interestingly with all these options, what if one important call from your family, wife and children comes up when you are in silent mode? Not to worry as the Llama has the solution for that as well, and it sets your phone to ring even though you have set your phone to silent mode. Moreover you can make, delete and create screen shortcuts to manage your sound profiles very easily. 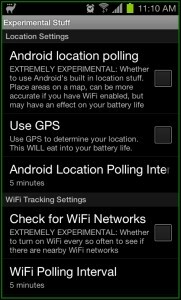 Since this a mobile location based service one would be eager to know how much battery would it consume as it tries to find out the GPS signal. 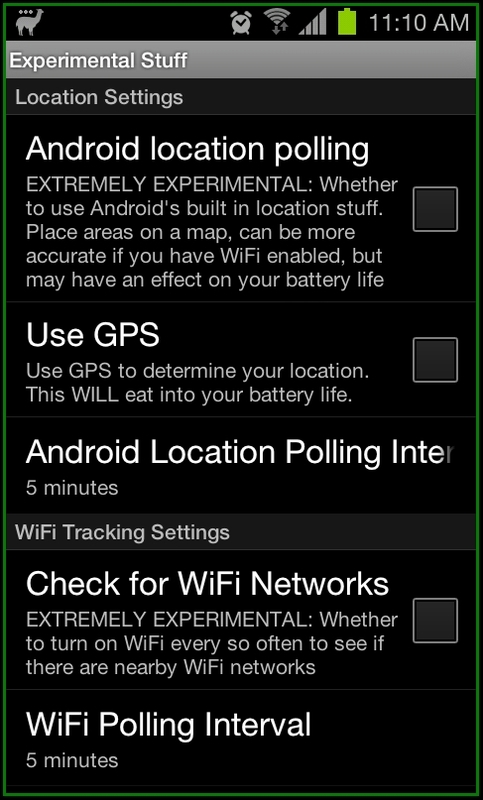 As claimed by Llama it doesn’t consume battery but we say the battery consumption by it is same as that of the other Android applications since it uses the phone masts or the phone cell site to figure out your location. Once you have installed this application on your mobile phone you would be first greeted with what called as boring stuff of accepting the terms and conditions, Accept it. Will provide you a walk through what does this application does. Now tap on OK Doke. There you are with the home screen of the application. It has various tabs of Areas, Events, Profiles and Recent. 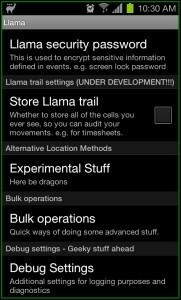 Llama Android application first need to go through the tutorial to make Llama understand your daily schedule and the cell sites to which whom you are connected from time to time. The profile tab is clearly meant for various profile settings of Loud, Normal, Quiet and Silent. When you tap on it, its activated. Now when you tap on Areas Section you will be able to see Home and Work Setup for you. 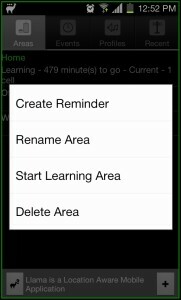 When you long tap on the Home you will be taken to the Create Reminder, Rename Area, Start Learning Area and Delete Area. As the first time user you need to select the Start Learning Area and then you need to provide the timing when you will be at home. Set it accordingly to your convenient time and as soon as you select a time, you will be back to the Home area region where in you will see the Home is set for xyz time on the go. You can easily delete, rename and start learning about those areas by long press on the respective ones. 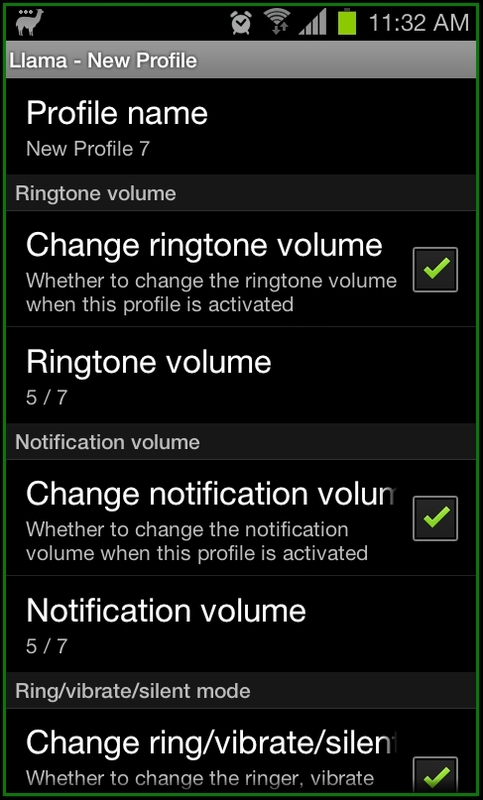 When you go through the Menu > Settings there are various options of notification mode, coloured event list, instant event confirmation, 12 hours time picker, disable volume button, unlock profile automatically, cell polling mode, polling settings, various Experimental stuff, bulk operations, debug settings. There is the option of Experimental Stuff and this is quite good option which allows you to access the under development options and features. Options under this might work or may not work out accordingly.Options under it changes from time to time. 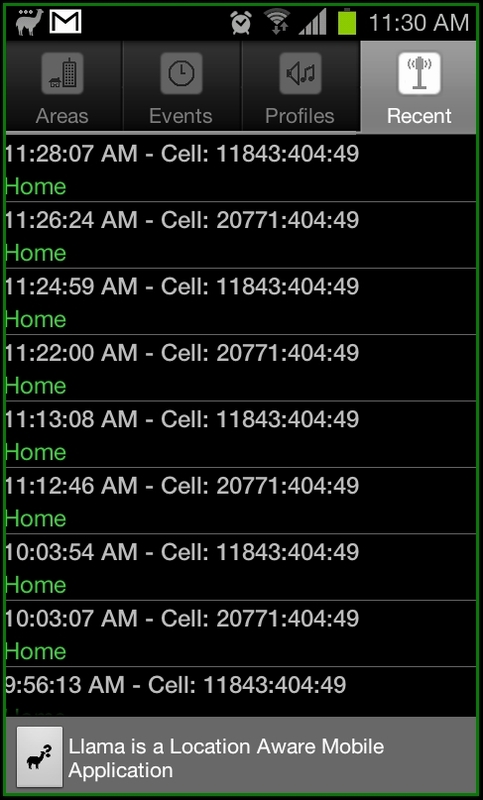 When you select Recent tab you will see all the events at when you are connected with the particular cell site with its name. 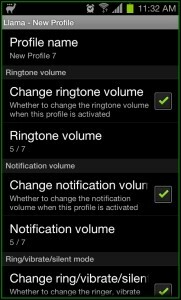 When you tap on the individual Settings, you can modify the ringtone volume for that particular profile along with the notification volume, change ringtone, change alarm volume, change in call volume and lot more. 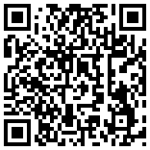 Llama Android application can be easily downloaded from Android Apps Labs for free. 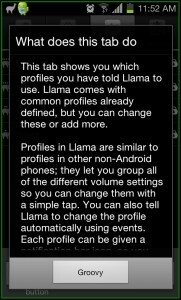 To download it directly on to your mobile phone, you need to visit the Android Apps Labs page listing of Llama application from your phone’s browser and then click on Install to automatically proceed with the installation. 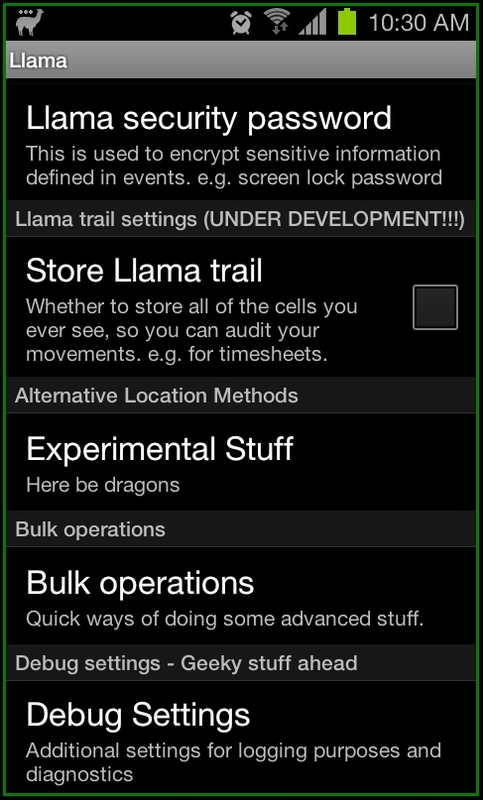 Llama is a wonderful application for any Android smartphone. We advise you to keep it as its most recommend must have application on your smartphone.